“What are you dancin’ in the street for? 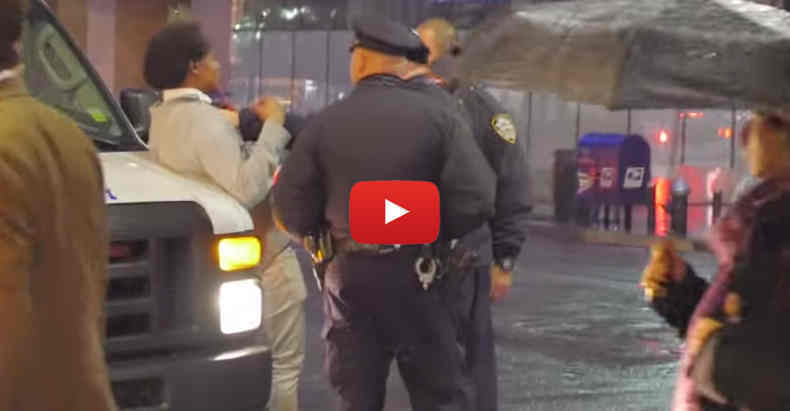 What the f**k is wrong with you?” barks the NYPD cop as he assaults a man for dancing. New York, NY — A harmless and humorous dance challenge by TV personality Ellen Degeneres, goes brutally awry after the NYPD gets involved. Ellen’s #DanceDares have brought humor and laughter to so many people, until now. Accosted and assaulted for dancing in the street on Christmas Eve. In what looks more like a gang bullying than a police detainment, BOK is immediately thrown up against the NYPD van while a hand clinches his neck – for dancing. During his detainment he was both physically and verbally assaulted by the heroes claiming to protect and serve him. After realizing that they could not arrest him, because he had committed absolutely no crime, BOK is thrown to the ground like a piece of trash. This type of brutal behavior by the NYPD is exactly why there are tens of thousands of complaints a year and a lawsuit is filed against them every 2 1/2 hours. When the police look more like schoolyard bullies than public servants, there might be a problem. In case anyone thinks that BOK was targeting police in order to solicit a reaction, the full video of all of Alexander BOK’s attempts at dancing is below.